A call to Thierry Voisin brings forth the news that he's cut the price of Royal Huisman's 25m sailing megayacht Volador once again. 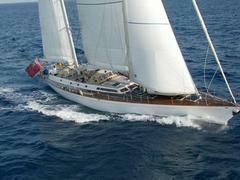 A very pretty yacht, she was built to a German Frers design in 1982 and refitted in 2005. With a practical layout of five cabins sleeping 10 guests, she's MCA compliant and, says Thierry, "is in top condition having always been well maintained." Previously reduced in June 2009 to €1.32 million, Volador is now asking €850,000.